After traveling throughout practically all of Latin America on our long road trip from Seattle to the very tip of South America, I can say that not only are there are a ton of amazing things to do in Buenos Aires, but it is also, without a doubt, one of the most incredible cities I’ve visited not only in South America but all of Latin America, yes, even cooler than Mexico City (which was my previous favorite). The reputation for Buenos Aires as a cultural hot spot of European style and taste is largely accurate and well deserved. 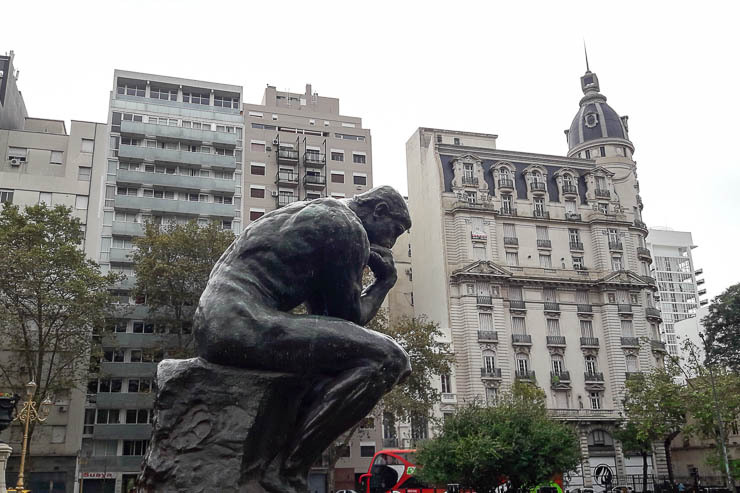 After traveling as much as I have, you realize that some places earn a reputation which doesn’t seem to live up to the hype, but with Buenos Aires, I felt that not only was it able to live up to the hype but surpass it in many ways. At least for me. 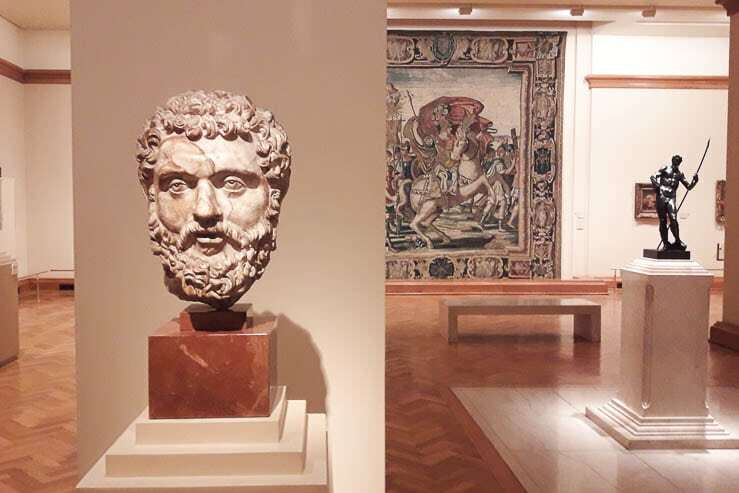 The bottom line, it’s an incredibly cosmopolitan city which will enchant most visitors and keep them busy throughout their stay because there are a ton of amazing things to do in Buenos Aires, Argentina! 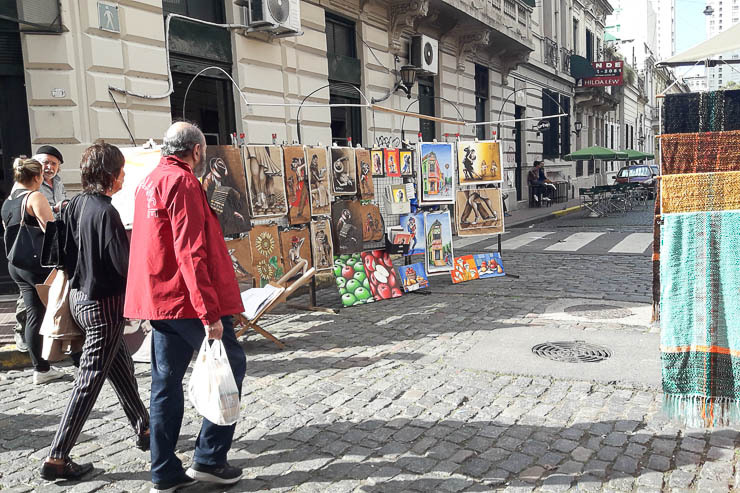 The neighborhood of San Telmo is one of the original old neighborhoods of Buenos Aires, and it is a popular place for tourists to call home during their stay in town. It is a bohemian and lively place at almost any hour of the day on any given day of the week, but no day is more alive than Sunday. 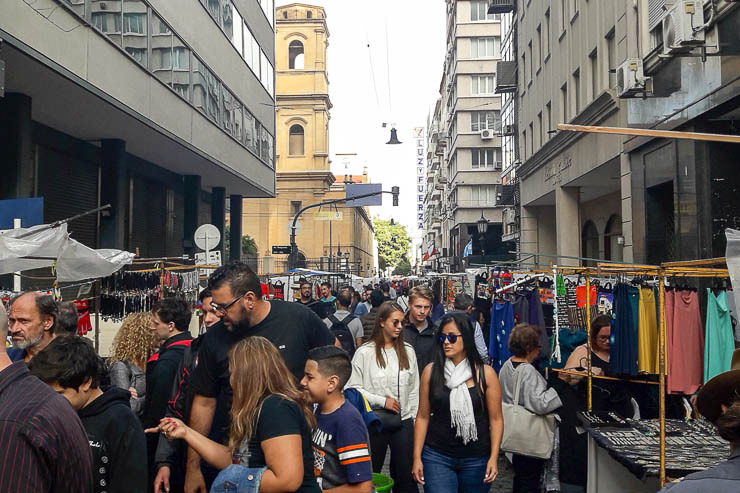 Every Sunday, a 10+ block length of the street Defensa turns into a large open-air market where vendors sell all manner of goods. There is no shortage of antiques, hand-made products, souvenirs, tasty treats, tango performances, or live music. 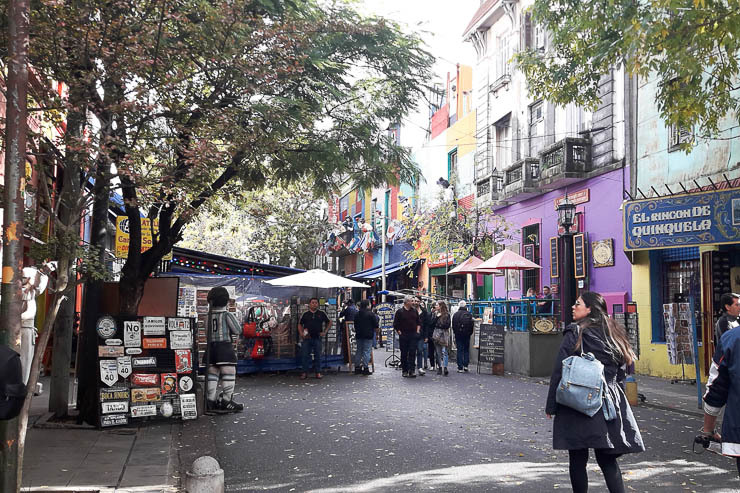 You can easily spend a few hours roaming up and back down the open air market which stretches all the way up to Plaza de Mayo. 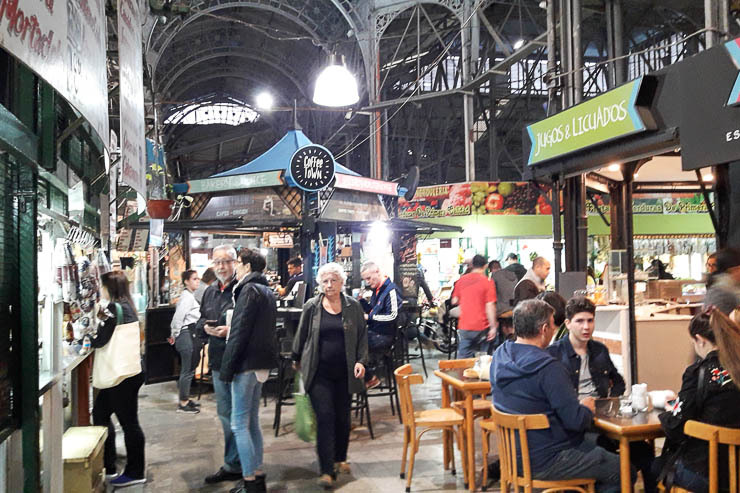 And be sure not to forget about the indoor San Telmo Market, which is also open for the rest of the week and is a place where you can grab a bite to eat at a restaurant, buy fresh produce or meat, antiques, or a good bottle of wine. We loved the churro place inside, La Churreteria, which easily had the best churros we’ve had since Mexico. 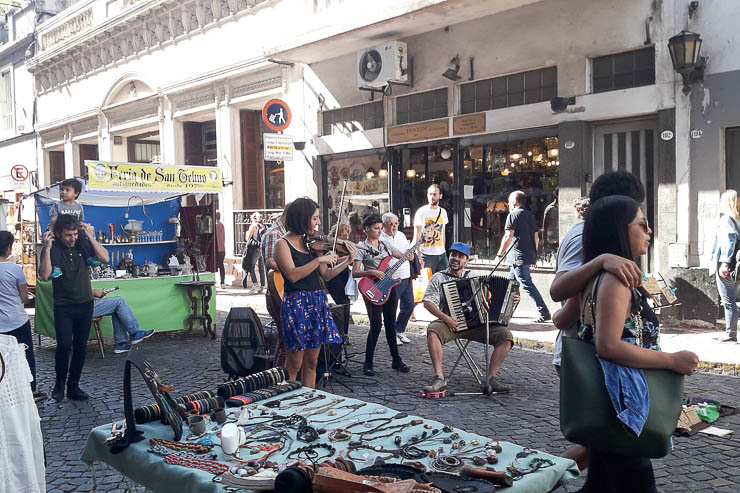 After the open-air market wraps up on Sunday, the revelry doesn’t end as people take to the streets to play music, gather in drum circles, or dance the night away in Plaza Dorrego. 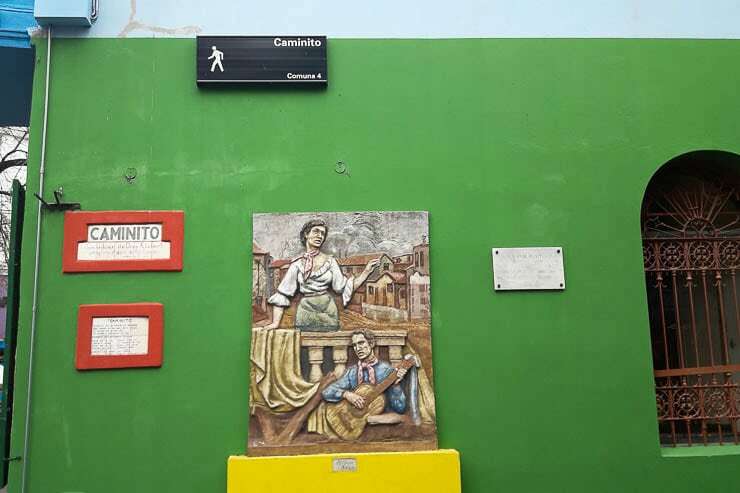 For something totally random in San Telmo, you should also take a look at the underground tunnels which connect in a patchwork fashion below the city. 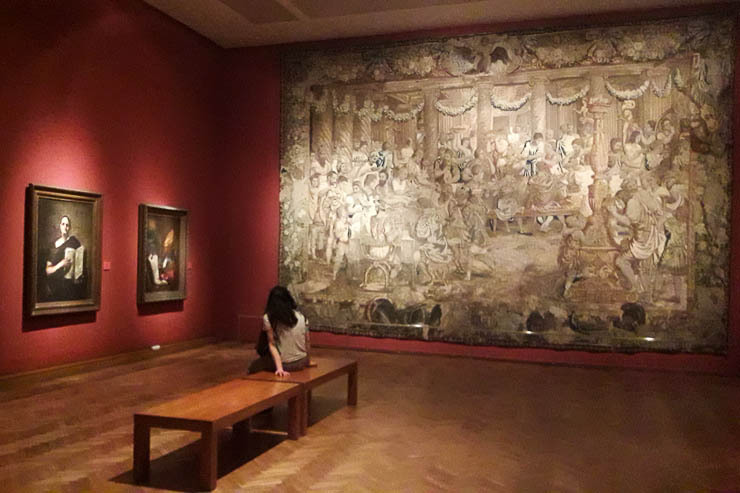 There are a number of restaurants where you can get a glimpse for free, or you can visit the more complete El Zanjón de Granados museum. 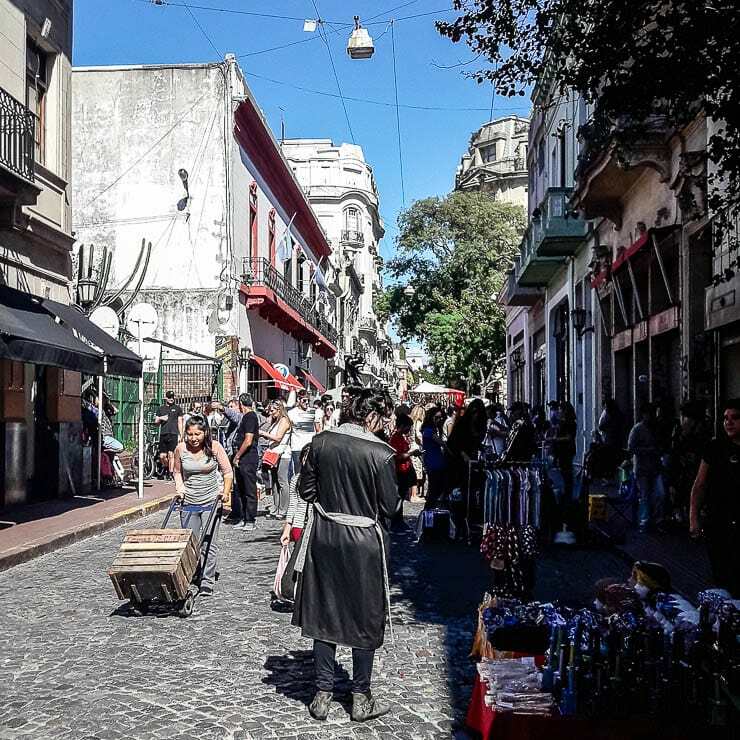 Honestly, I’d recommend staying here in San Telmo if it is your first visit to the city, as you will never be left asking yourself about what to do in Buenos Aires — there is just a certain life and vibrancy in San Telmo that is hard to beat. Going to a cemetery might seem like a strange suggestion, but this cemetery is unlike most. Here you can wander through elaborate tombs that were built to house the remains of the cities most famous, powerful, and rich families. These tombs are more like opulently directed little houses, made of intricately carved marble, adorned with statues, and domes. It’s a hauntingly beautiful place… More like an open-air art and architecture museum which just happens to house the remains of the dead for many thousands of people. Entrance to the cemetery is totally free and totally fascinating. While a foreigner isn’t likely to recognize many of the names of the people entombed here, the one big exception would be that of Evita Peron. 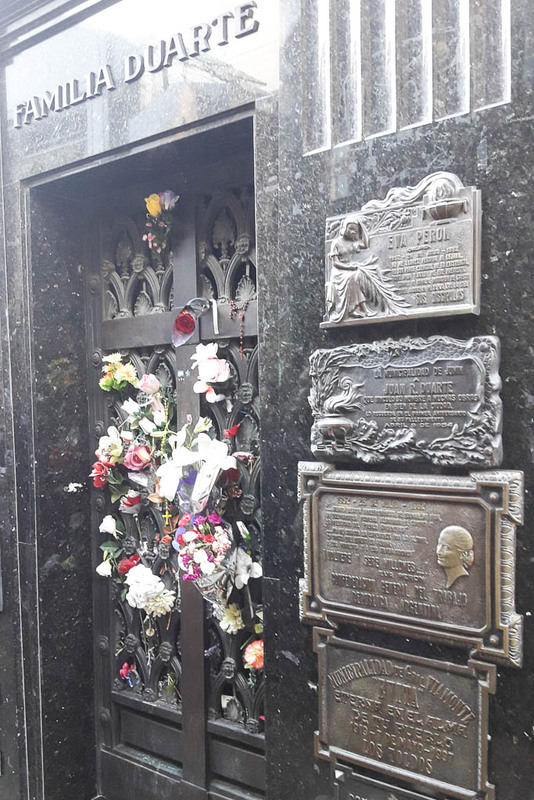 Her family grave can be found here in Recoleta, and while the tomb is surprisingly modest, it still receives many visitors who often leave flowers in remembrance of all she fought for in Argentina. 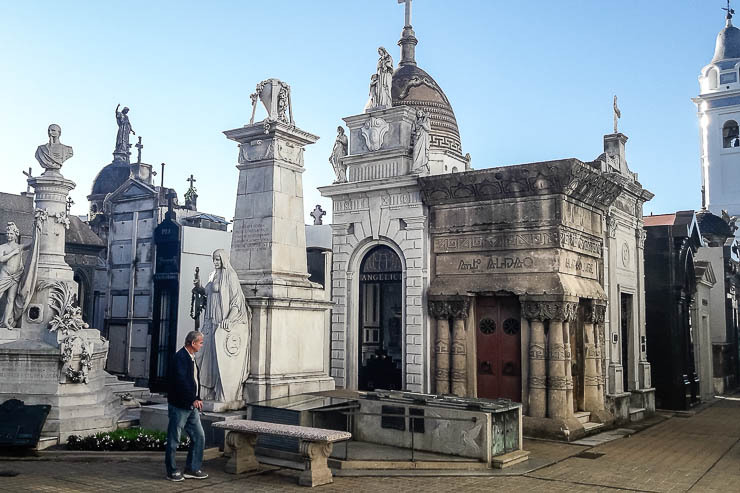 When you finish at the cemetery, be sure to head out to explore the Recoleta neighborhood which is one Buenos Aires’ most beautiful, filled with stunning French architecture and former palaces since converted into embassies, hotels, and other things. Avenida Alvear is the main thoroughfare here and has been called one of the world’s most distinguished avenues. Palermo Viejo is located in the northwest corner of the city, somewhat far from the downtown core. 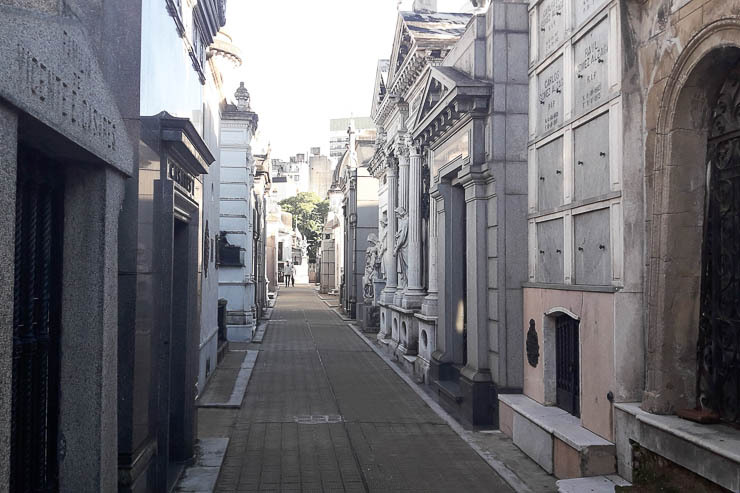 It, along with Recoleta, is where the more affluent members of Buenos Aires fled following a large Yellow Fever outbreak in the late 1800s. 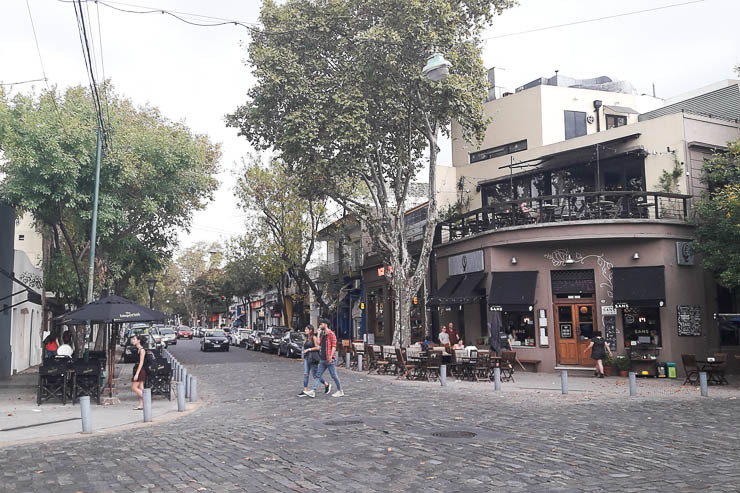 Today you will find a lively mix of bars, restaurants, and shops all throughout Palermo Viejo, in both Palermo Soho (so named for its supposed resemblance to New York’s Soho neighborhood) and in Palermo Hollywood (so named because of the number of TV and radio stations based here). 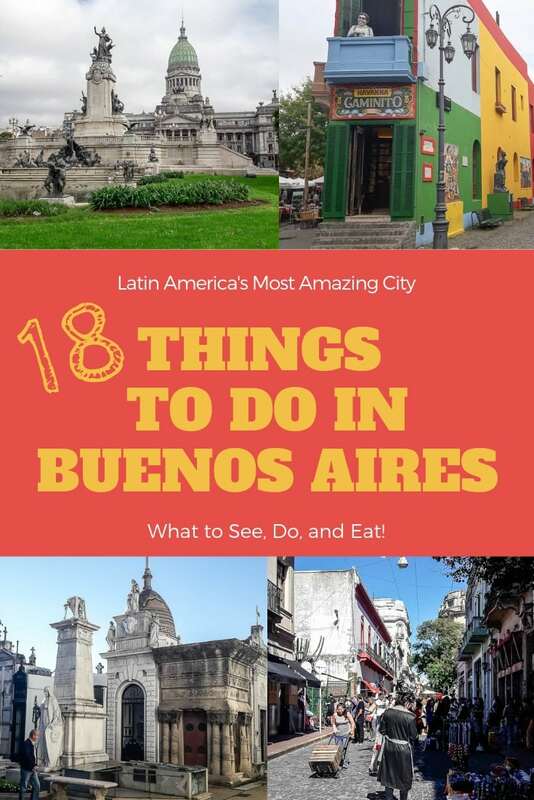 While it is a bit more outside the geographical concentration of this list of things to do in Buenos Aires, it still makes for a great day trip head up and explore this vibrant and interesting corner of Buenos Aires (or many travelers stay here rather than San Telmo). To the north, you will find a large series of green public spaces, gardens (such as the famous Japanese Gardens or the beautiful Paseo de Rosedal), parks, and more, which give this place a more laid back and quiet vibe, even though this large neighborhood also houses some of the best nightlife in the city (Palermo Viejo, that is, not the parks). The area around Plaza Serrano (also known as Plazoleta Julio Cortazar) is pretty much the center of what is called Palermo Soho and was the area that we found to be the most interesting, so just head that way if you are a bit confused where to go after getting out at the Palermo subway station. La Boca is a neighborhood located south of San Telmo, and is also one of the original neighborhoods of old Buenos Aires. 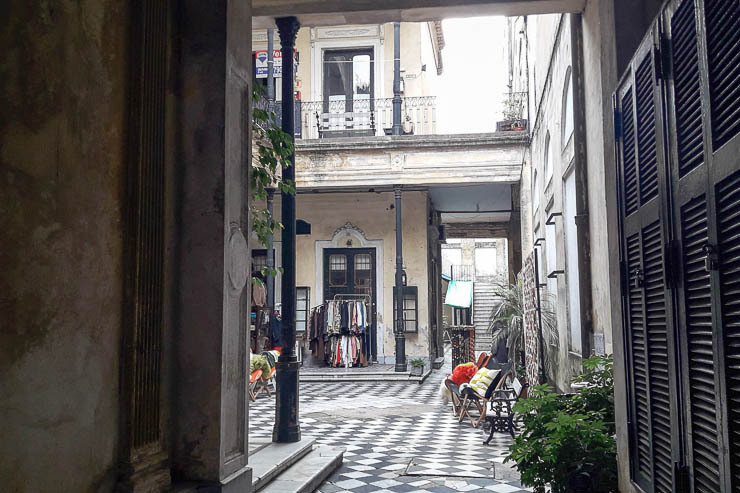 San Telmo was always a bit more upscale, whereas La Boca was decidedly poorer–a place where recently arrived Italian immigrants lived in cheap clapboard houses and worked in the meat processing plants nearby. This has always been a rough and tumble neighborhood, and that is still true today. You should not visited the Boca neighborhood at night, nor wander too far off the tourist trail… The heart of La Boca is El Caminito (the little street) where a few blocks preserve the original vibrant and colorful street scenes that locals used to spruce up their houses made of corrugated metal and wood. 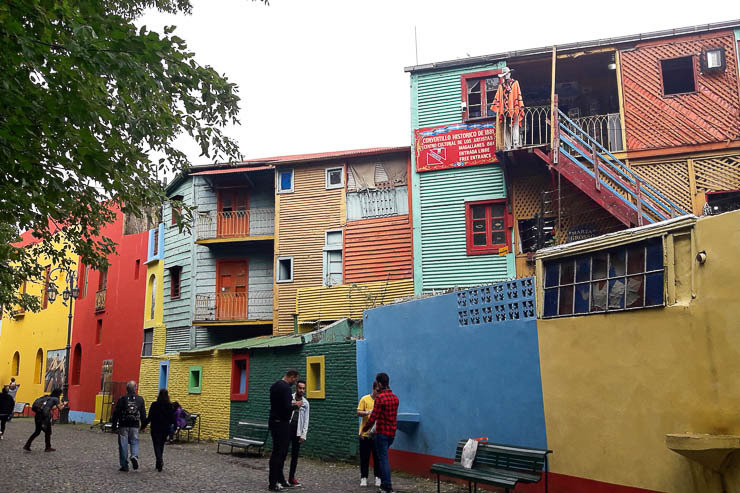 This colorful place is also where tango was supposedly born. Today it is quite obviously a tourist trap, a place where people are constantly hustling you to come inside their shops, restaurants, etc. (the only place in Buenos Aires or even all of Argentina where this happened). 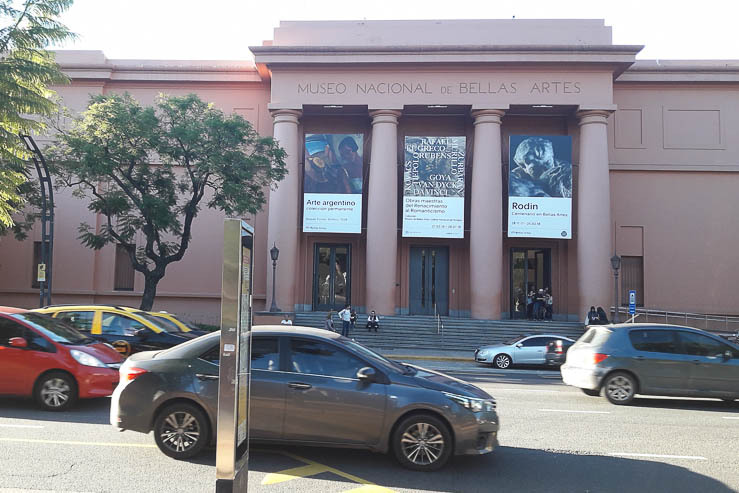 I don’t particularly like places like that, but it’s still a cool place to visit for a few hours so you can better understand the often complicated history of life in Buenos Aires. It’s a good place to grab a bite to eat, buy souvenirs, or to pick up some relatively cheap leather goods if that’s on your list. You can wander through El Caminito in a short time, but plan to stay for an hour or two. 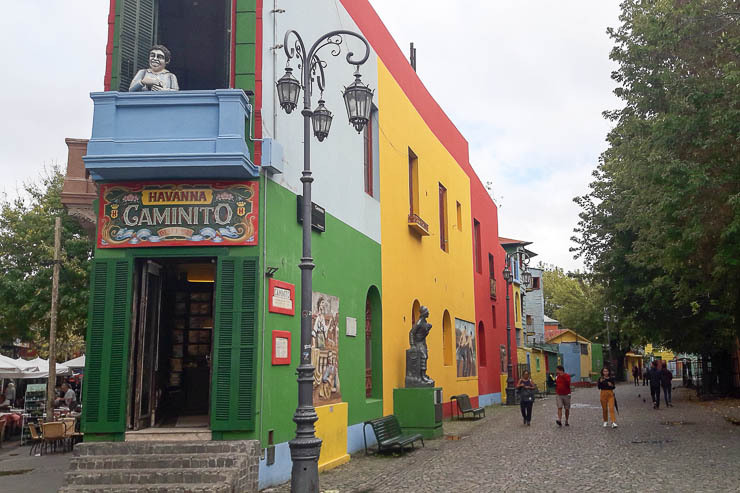 If you’re in San Telmo, you can easily reach El Caminito by taking bus #29 both to and from La Boca. 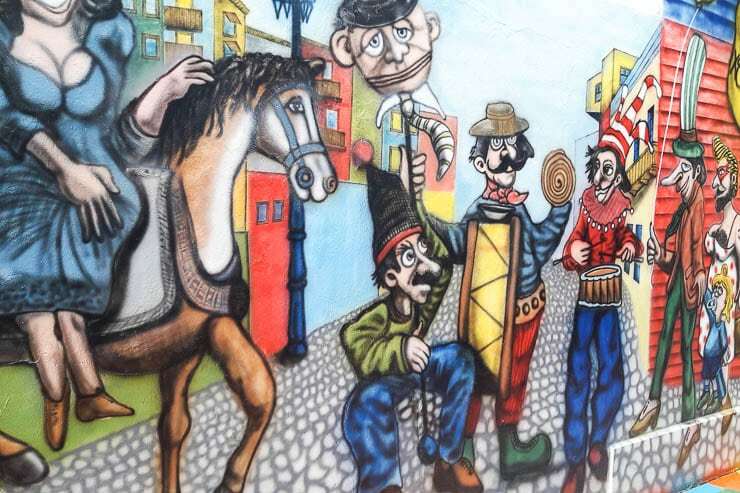 Another popular attraction in the Boca neighborhood is the short, four block walk to La Bombonera soccer stadium, which is the home of Boca Juniors and where the famous Maradona played. But honestly, unless you’re a real football/soccer fan, it isn’t really worth the visit just to see the exterior of the stadium — but going to a game would be a different story. 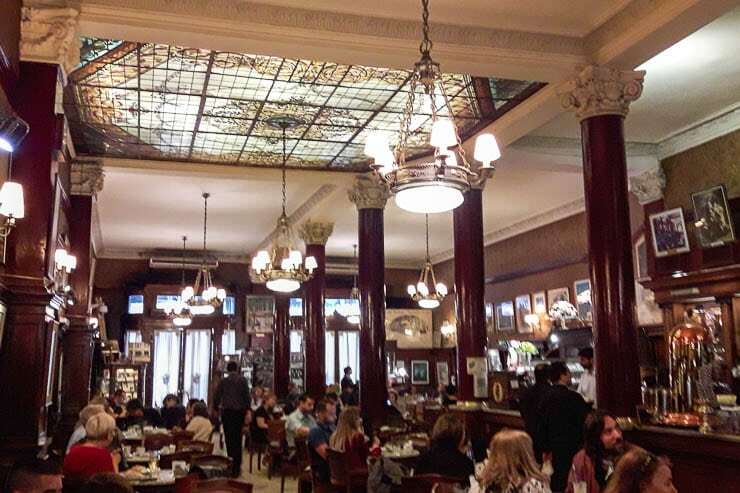 Cafe Tortoni is an institution in Buenos Aires with more than 150 years of history in this city. 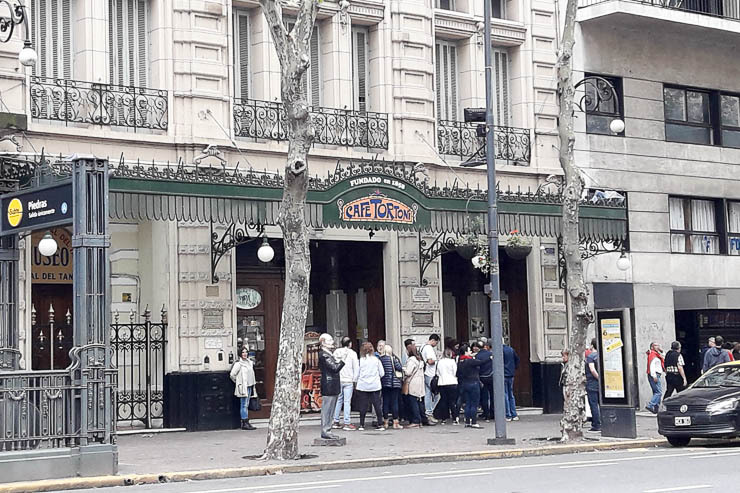 The cafe was started by a French immigrant in 1858 and has been called one of the 10 most beautiful cafes in the world… Famous people ranging from Carlos Gardel, Hillary Clinton, and Robert Duvall have all visited this place, and you should plan on checking it out too. Yes, the space can be pretty touristy, but it is highly popular with Argentineans alike, and you will probably have to wait in a short line to get a table. The interior of the space is incredible, and stepping inside is like stepping into a different time, social class, or continent (yes, very European). Prices are higher, though not totally unreasonable, but to save money we just got cafes with some snacks, — they’ve got a full menu available here too. 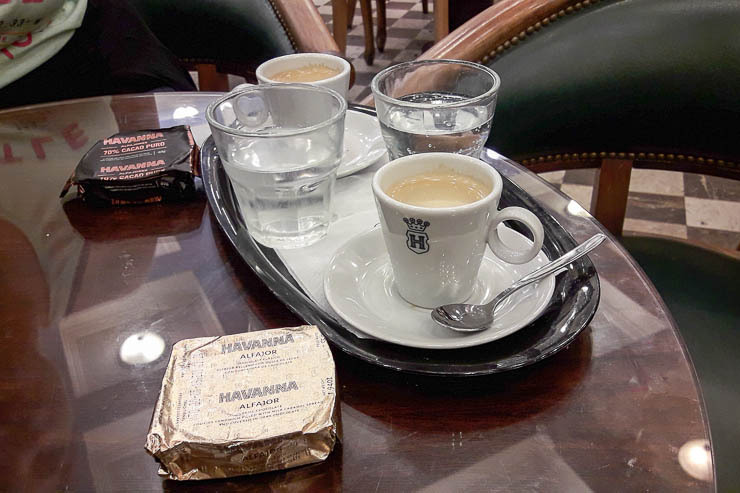 In terms of the quality, the coffee and snacks were good, but by no means the best we had in Buenos Aires. Regardless, I’d highly recommend a visit. 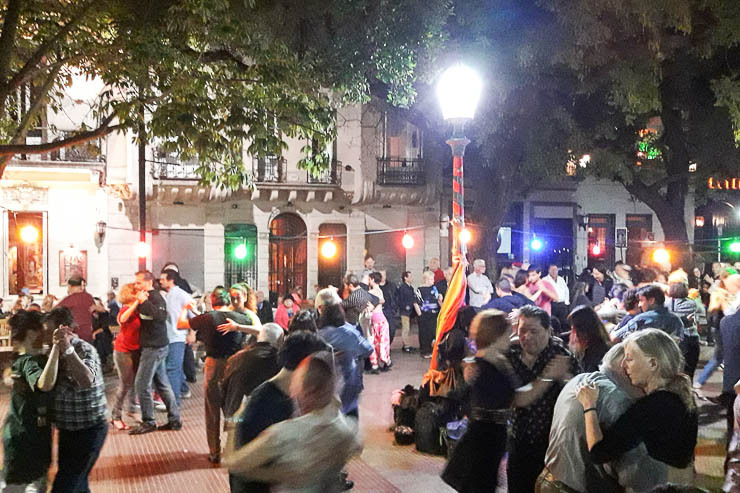 Milongas are events where they dance to tango music and is something that happens regularly throughout the city on a weekly basis (most often). The actual venues where they dance are also referred to as milongas too, just to confuse you. In any case, these regular dance events are something to behold, even if you would never be caught dead on the dance floor. This is like the heart and soul of Buenos Aires and what makes this city feel so vibrant. 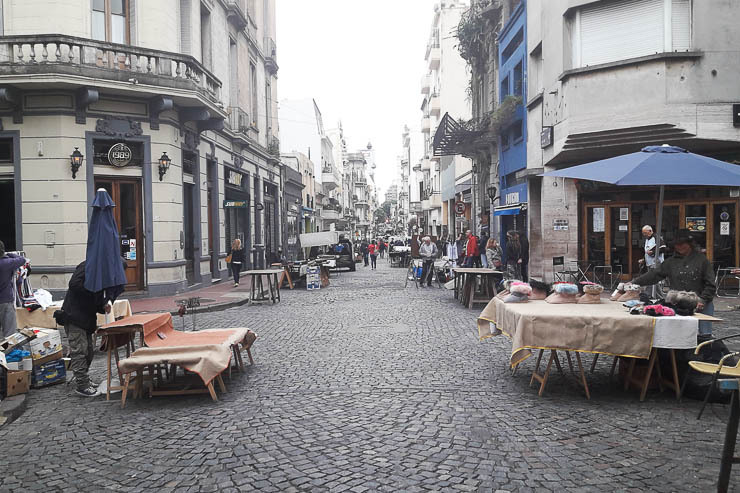 There are plenty of venues which hold milongas, though the best ones, in my opinion, are the free open-air ones that take place in many of the city’s plazas, such as San Telmo. The routine usually consists of three to five songs (called a tanda) that you dance with your same partner, then there is a musical break to clear the dance floor and change partners or rest for the next tanda. 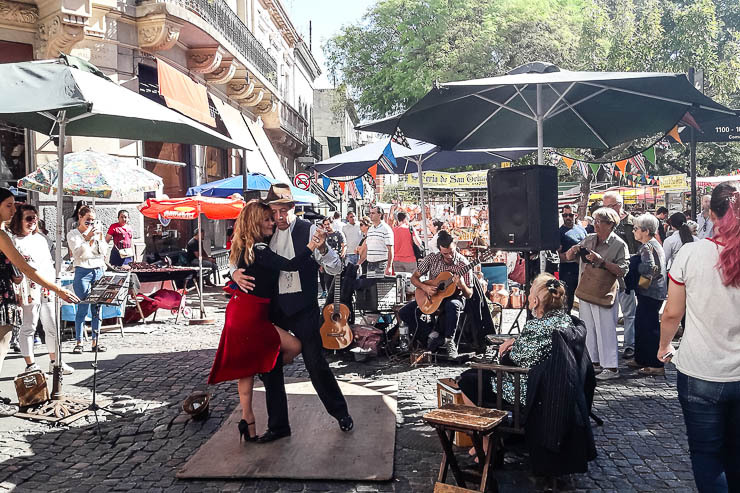 The milongas are much cooler than the glitzy tango shows that they sell to tourists, although if that’s you’re thing be sure to do BOTH a milonga and a formal tango show (although you will see a much higher caliber of dancing at a paid show, of course). 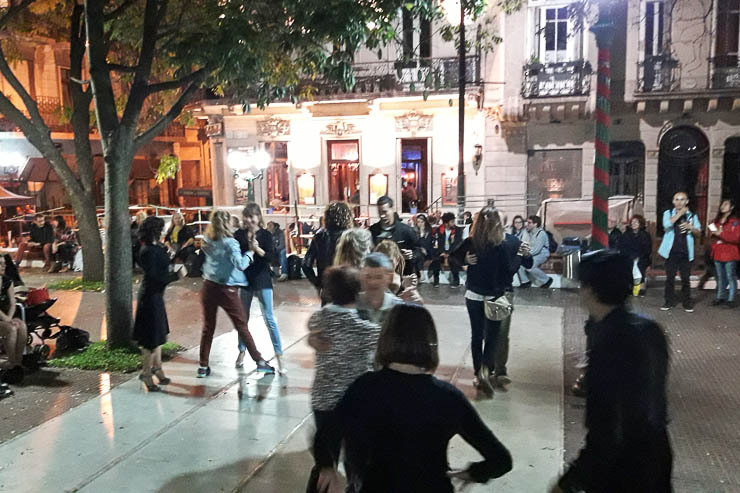 It is impressive to watch the milonga, but if you’d rather take part in the action, you should plan to take some tango lessons here in Buenos Aires. The good news is that most milongas include a free dance lesson (tips expected) before the actual milonga kicks off, so you can come about an hour early, learn and practice the basics, and then jump in feet first on the dance floor with a variety of partners. 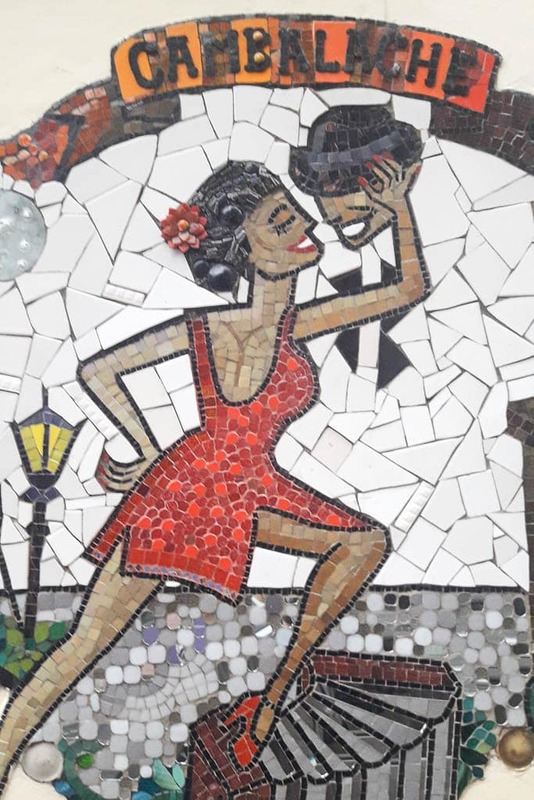 You might not know much about tango, but surely you’ve heard the song Por una cabeza by Carlos Gardel, the famous French-Argentine who is without a doubt the most prominent figure in the history of tango. Gardel actually died in a plane crash in Medellin, Colombia, a place that I have lived for many years and which also pays homage to him with a small museum. 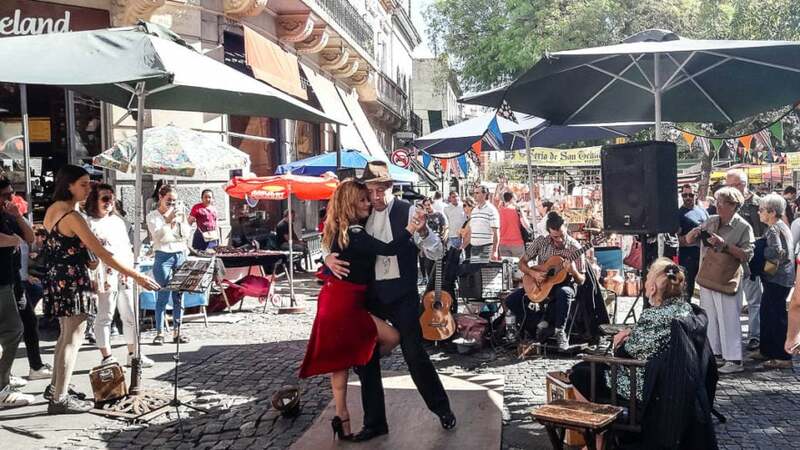 You can book your Buenos Aires tango lessons here. Buenos Aires has a huge legacy of Italian immigrants which is what makes this one of the world’s best cities. 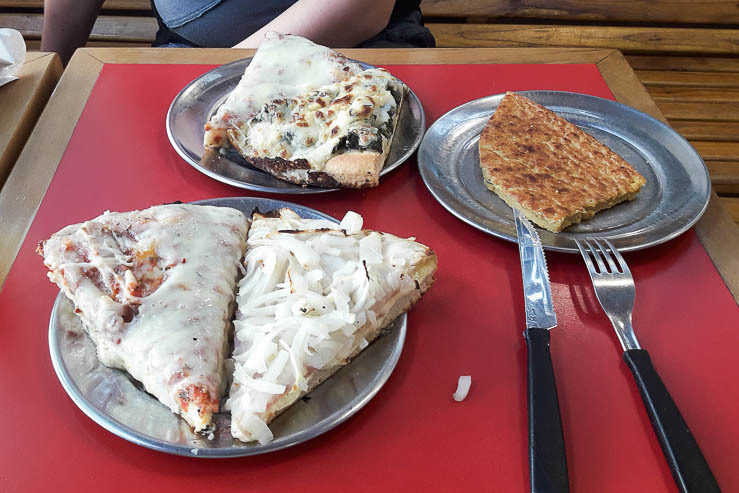 I’ve lived in Florence, I’ve spent lots of time in New York City, but pizza by the slice in Buenos Aires is pretty amazing. The pizza here is also distinctly different than everywhere else with unique toppings and a different take. I’d encourage you to try the fugazzeta which is an onion-heavy pizza that rocks. Another thing you’ll see commonly served at these pizza-by-the-slice places is faina, which is a strange garbanzo bean flatbread… I didn’t love it, personally, but you’ll see it offered quite a lot as part of a pizza combo. 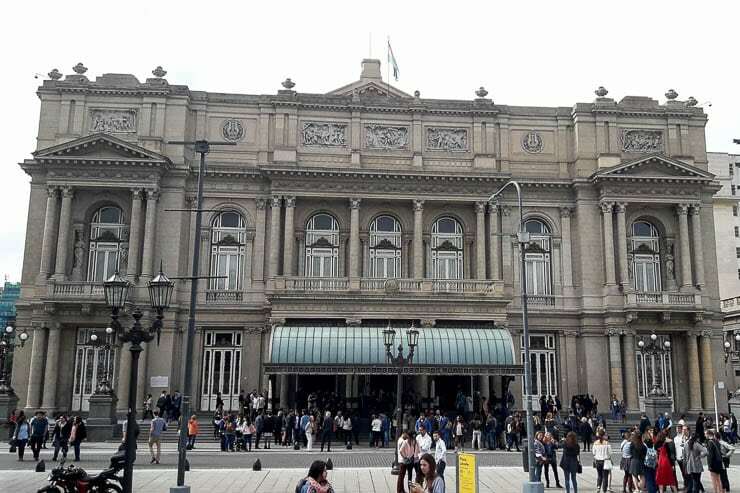 Teatro Colon is a more than 100-year-old opera house in the center of Buenos Aires, which has been called one of the 10 best opera houses in the world by Nat Geo and is often cited as one of the best opera houses for its acoustics. 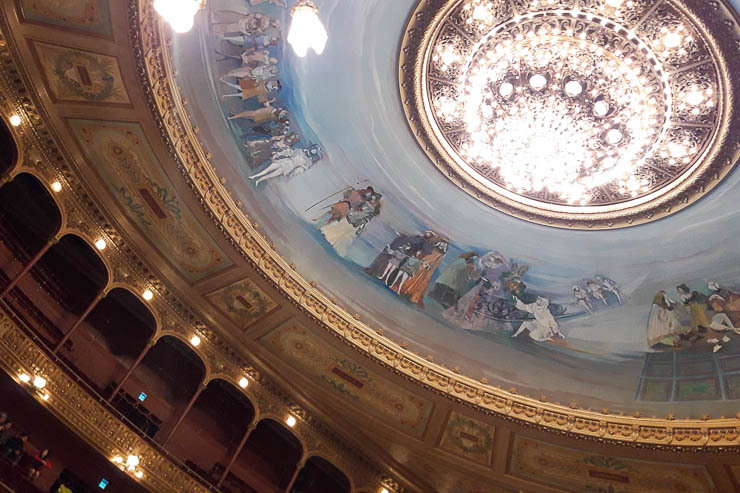 While you may not be super interested in opera, the space itself is ornate and breathtaking and definitely deserves to be among the top of the best things to do in Buenos Aires. 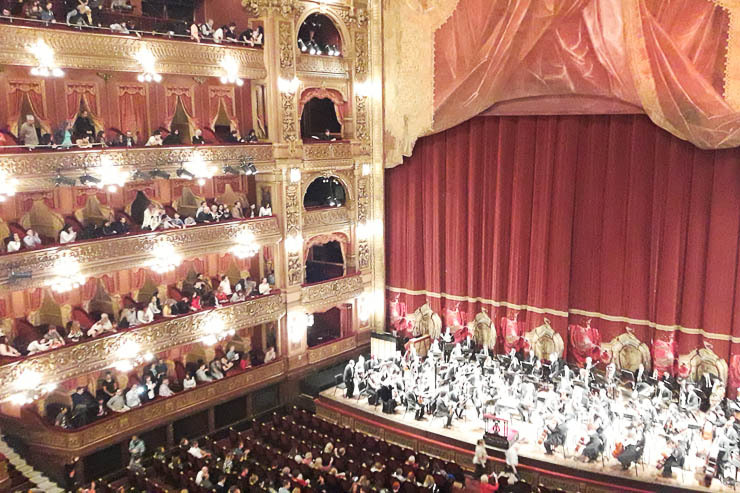 While you can buy tickets to tour Teatro Colon, the best way to experience it is with a show, and even better with a free show! They frequently offer free tickets to classical music performances which you can grab a day or two before the event. While these free shows are at odd hours like 11 am, they are totally worth it if you don’t want to shell out big bucks for an evening performance. Ah yes, Argentina is perhaps most famous for their love of meat… So, unless you’re a vegetarian, you have got to plan on a night out for steak and Malbec (Argentina is the source for this famous wine). There are many different cuts like bife de lomo (tenderloin), entrana (skirt steak), vacio (flank steak) but the best is often considered to be the bife de chorizo (sirloin steak). It will often be served up with a generous helping of chimichurri (an amazing mix of olive oil, garlic, parsley, and more) to slather on top and can be paired with a good malbec house wine. 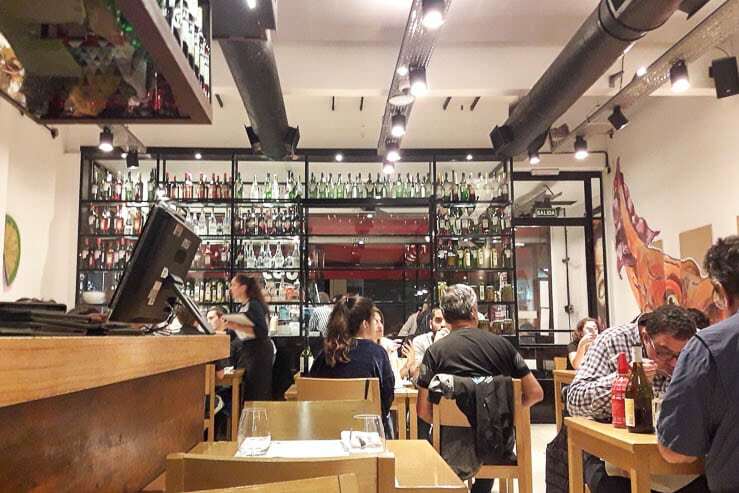 You can get a really, really good steak and wine dinner here in Buenos Aires for much cheaper than you would in virtually any other part of the world. 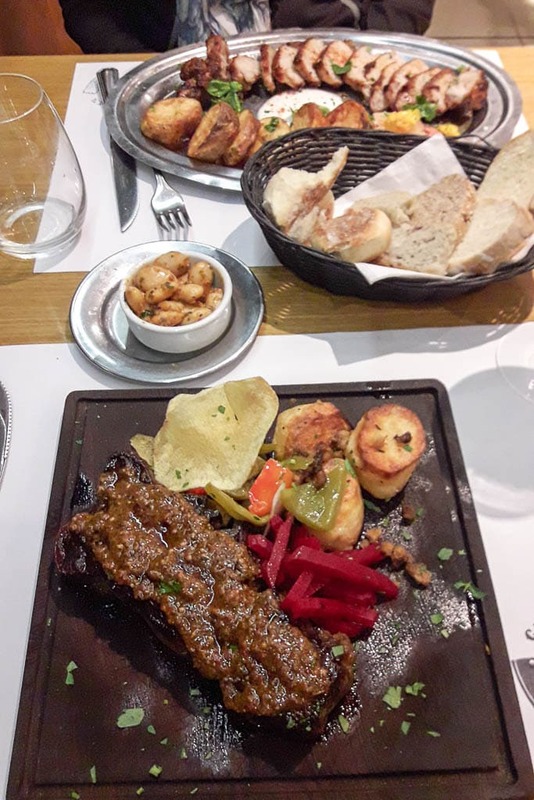 Our best meal in Buenos Aires was at Cafe San Juan in the San Telmo neighborhood, where we both had a pretty fancy and elegant meal (at least for us!) for just $50 total. If you want something a bit crazier, like never-ending meat, you should head to Siga La Vaca where you pay a fixed price and basically eat everything that you want. Meat lovers only. 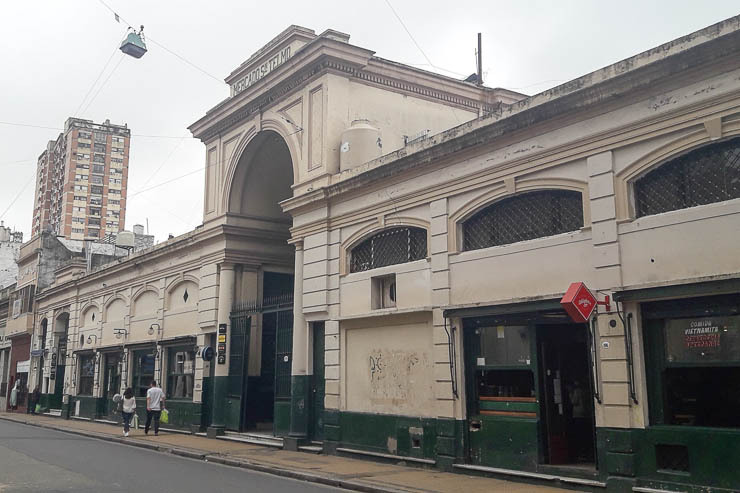 If, on the other hand, you’ve grown tired of the endless supply of meat and pasta in Buenos Aires, then you may want to check out something a little different like one of those famously underground closed door restaurants (puerta cerrada) where you have to be in the know to go. Here is where some of Buenos Aires most innovative chefs cook up something a bit different to a discerning clientele. You can find places like this on social media or a quick Google search. I love books and bookstores… Collecting books used to be a hobby of mine before a became a minimalist nomad. 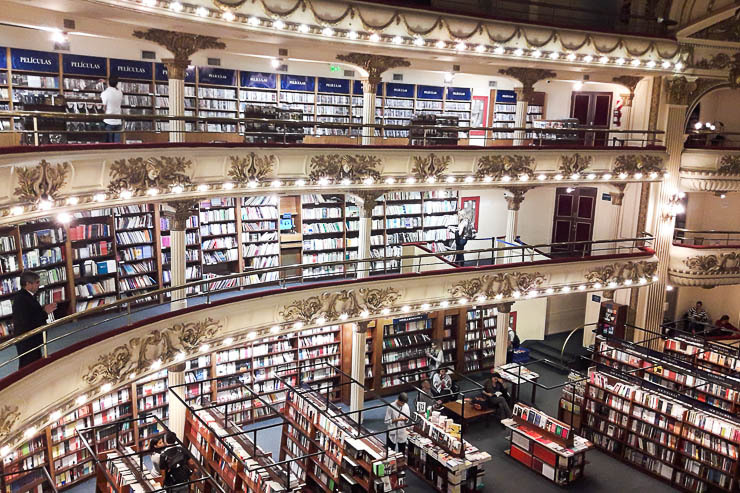 I’ve been to some pretty impressive bookstores over the years, whether Powell Books in Portland, City Lights in San Francisco, or The Strand in New York City — but there is nowhere like El Ateneo! This is bar-none the most beautiful bookstore I’ve ever seen. 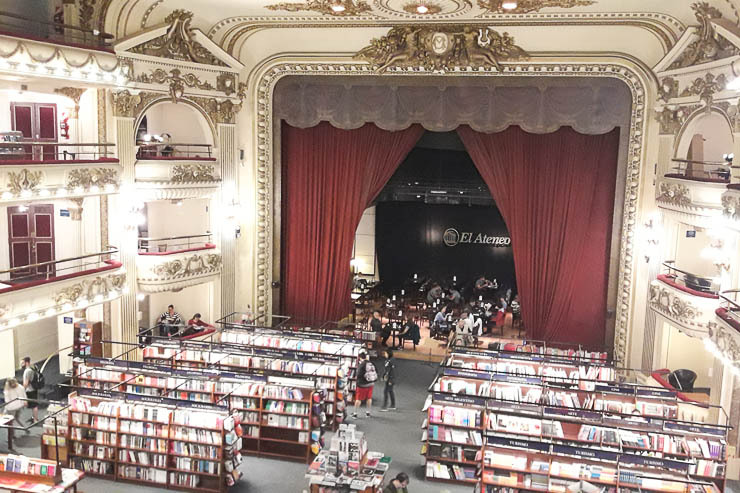 A bookstore seems like a strange thing to include in a list of things to do in Buenos Aires, but I’m telling you, you gotta go. It is set in an old theater, which is why it is so majestic. Wander the aisles, enjoy the opulence, buy a book, grab a coffee. Just go check it out. In an age where bookstores are dying off, this is a gem. The Museo Nacional de Bellas Artes is an immense collection of art, one of the largest in all of Latin America, representing a wide swath of art ranging from the Middle Ages up to the 20th Century, and featuring a wide range of both Latin American art and European artists such as Monet, Rembrandt, Manet, Degas, and many many more. 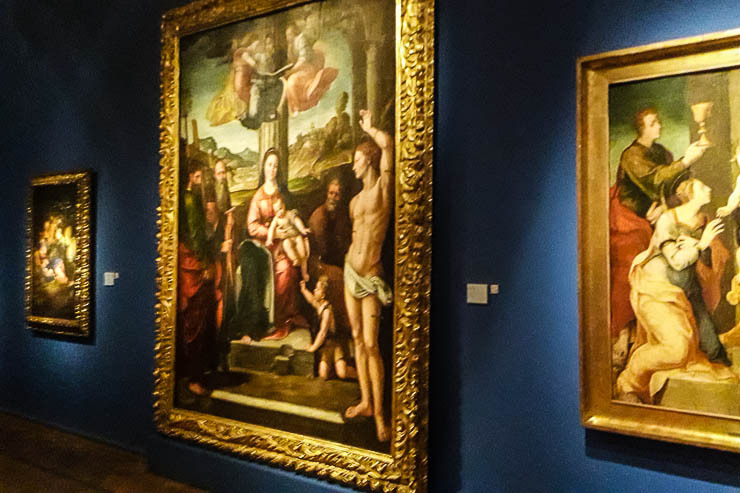 The museum is well laid out and has a nice, logical flow among the 24 exhibit halls, and incredibly, entrance to the permanent collection is free! So it is a no-brainer to pass through here or make it the focal point if you’re looking for things to do in Buenos Aires when it rains. Yep, more food! 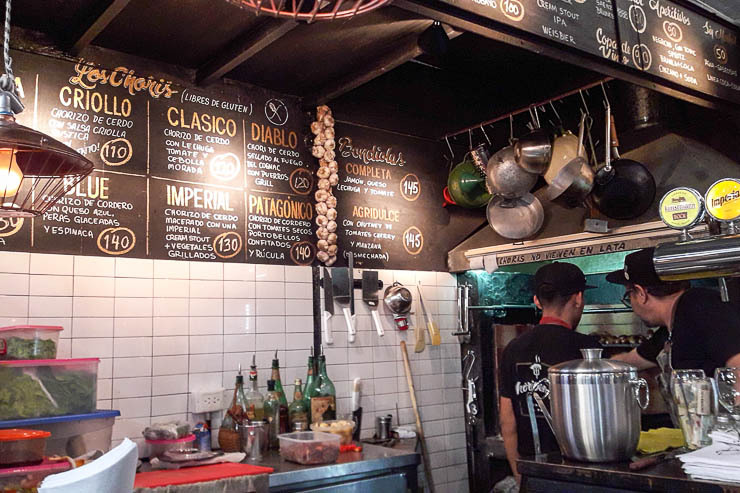 Buenos Aires is a foodie paradise, I think, especially if you are a meat lover. 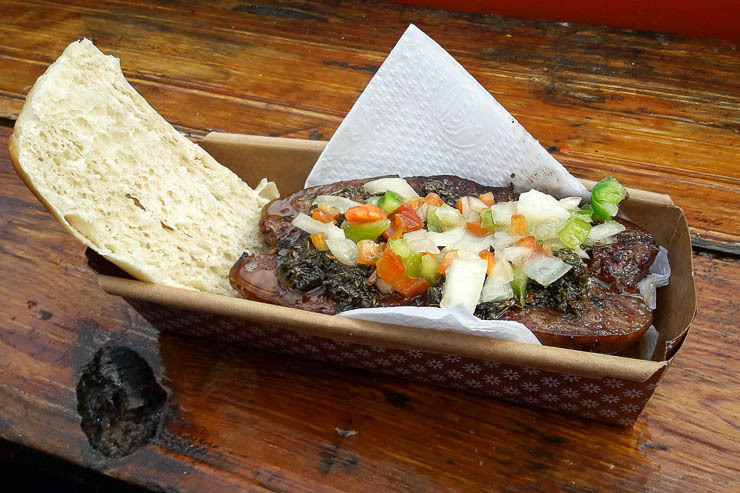 The famous choripan is a chorizo sausage sliced in half, served up on a bun, and, in its most basic form, is served with a generous slather of delicious, green chimichurri sauce. Whenever I was hungry and walking around, my go-to was either choripan or pizza by the slice. You can’t go wrong with either, really. Or the delicious Argentian Empanadas, which are like little meat hot pockets – hah. 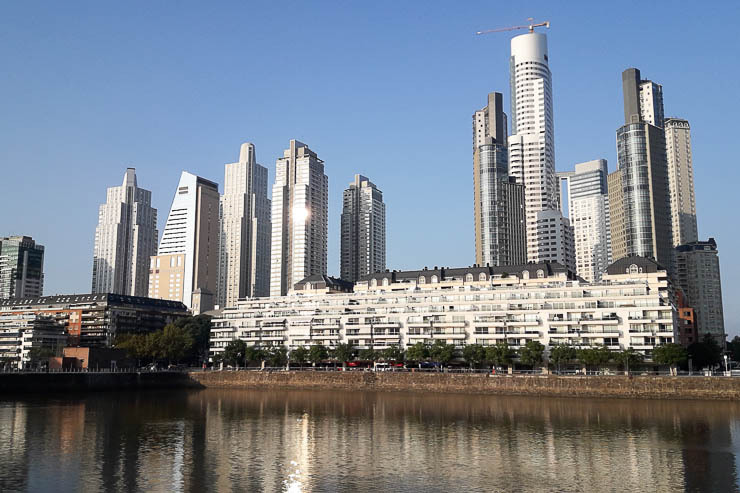 It is hard to put your finger on what exactly makes Buenos Aires such a dynamic and incredible place, but for me, I think part of that draw is based on the vibrancy of the street life and that whole European feel… A big part of which stems from the architecture and design of the city. 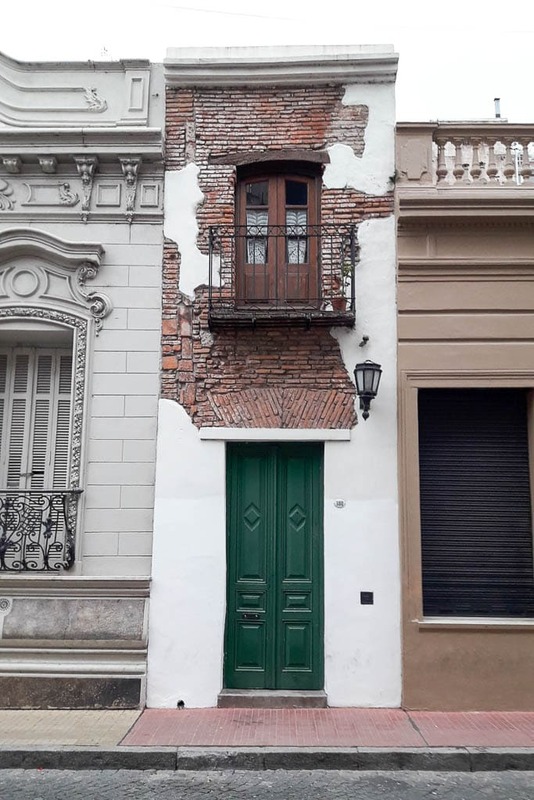 There is no better way to get a feel for Buenos Aires than to just stroll through the streets, pop your head into places that look interesting, and marvel in the intricacies of the architecture. 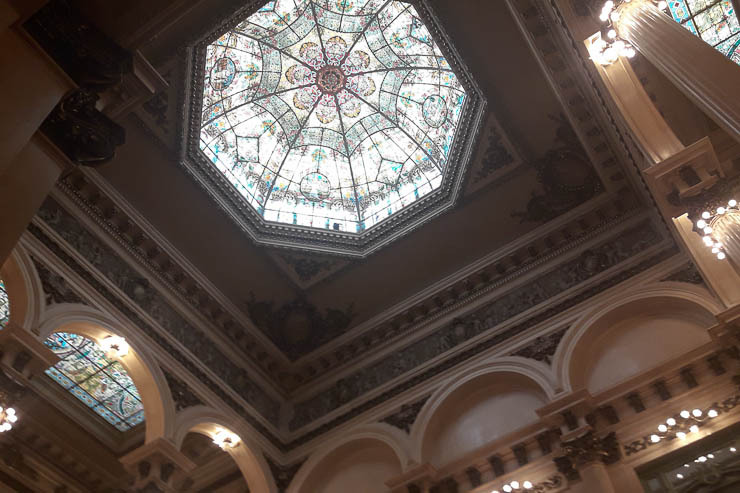 You can stroll aimlessly, or if you are looking for something more structured, I’d recommend walking from Plaza Dorrego in San Telmo, north toward the Casa Rosada, from there head west on Av de Mayo until you hit the Congress building, then meandering up toward Teatro Colon. 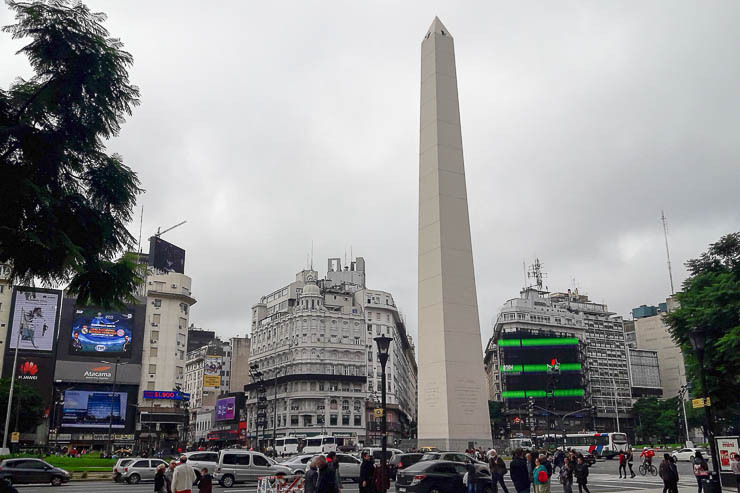 From here you could head toward Recoleta with its old mansions and then take the subway back, or you could backtrack to toward the Obelisk, crossing the Avenida Corrientes (the widest street in the world, purportedly) and then walk along the pedestrian-friendly shopping part of Florida. 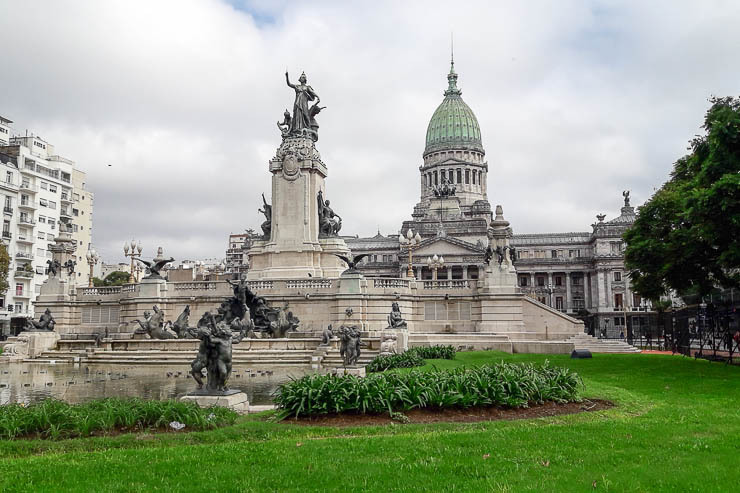 The architecture, the monuments, the lively street life, it all captivated me in this incredible city, and my daily random walking tours were perhaps my favorite of all the things to do in Buenos Aires. Alfajores! 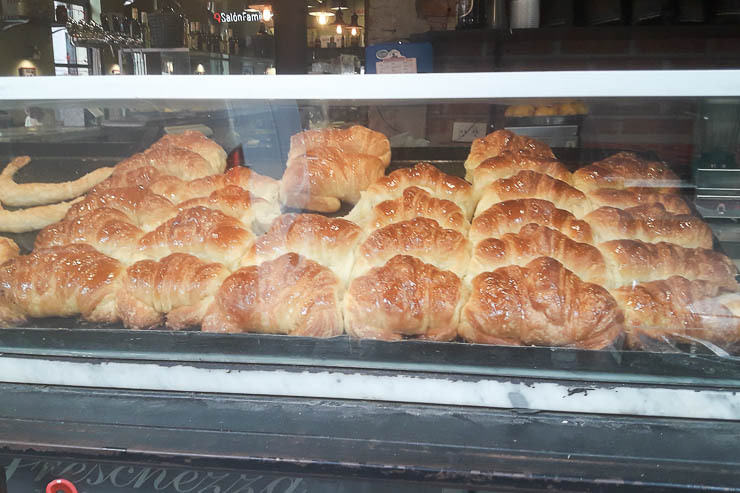 My favorite sweet treat in Argentina… While there may be alfajores in Chile or other Latin American countries, I think Argentina does them best. Fundamentally they are two cookies with a caramel filling like between, and often coated with chocolate. They are rich and decadent, without a doubt, and can be found almost everywhere, but there are some that are better than others… The vast majority you’ll see are mass produced and filled with sugar and preservatives, while if you can find some much higher quality, artisan alfajores which are better still. 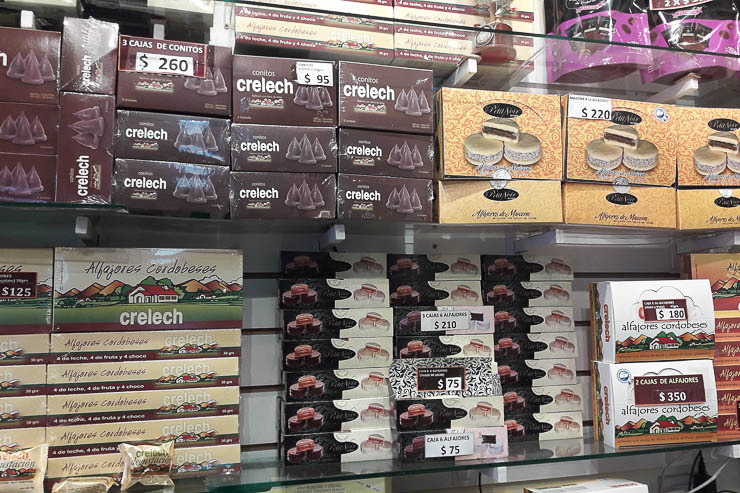 We tried so many alfajores looking for the best gifts to bring back and loved the ones they sell at Crelech in San Telmo (specifically the Petit Noir brand they sell). Runner up was definitely the dark chocolate alfajores that they sell at Havanna, even though they are mass produced, they were still uh-mazing. 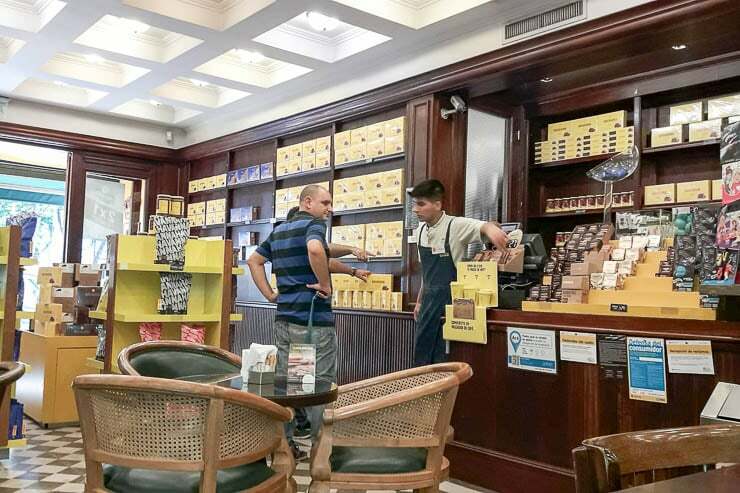 Speaking of Havanna, it is a pretty awesome cafe chain throughout Argentina, but cafes are absolutely everywhere! Which is also what gives it that sort of European street vibe. 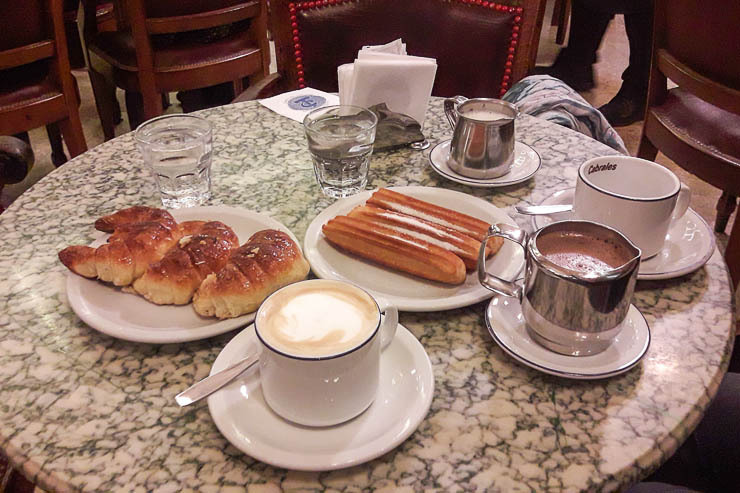 You can easily pop into a corner cafe and order up your favorite caffeinated beverage along with some medialunas (little sweet croissants)… In fact, that was an almost daily occurrence for us, and something I’d highly recommend. Skip Starbucks and try a different local cafe every day… They make good places to take a quick and cheap break from all the walking you are bound to do. The United States has the White House, and Argentina has the Pink House. 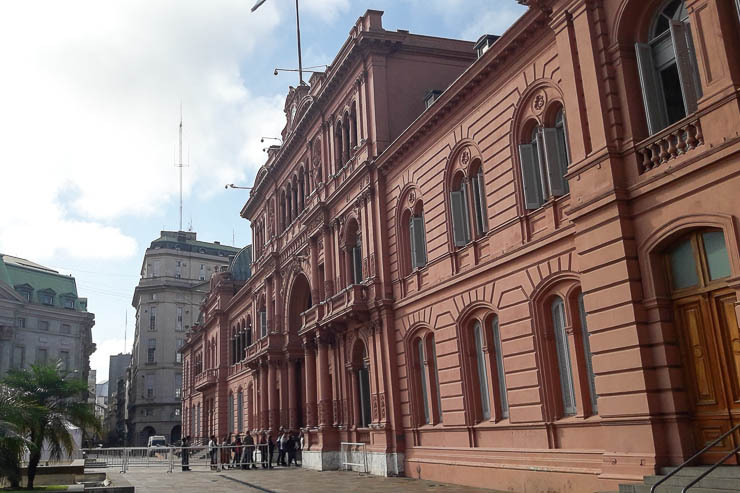 La Casa Rosada is the famed presidential palace or the Casa de Gobierno. This landmark is one of the most emblematic buildings in Argentina and has been declared a national historic landmark. 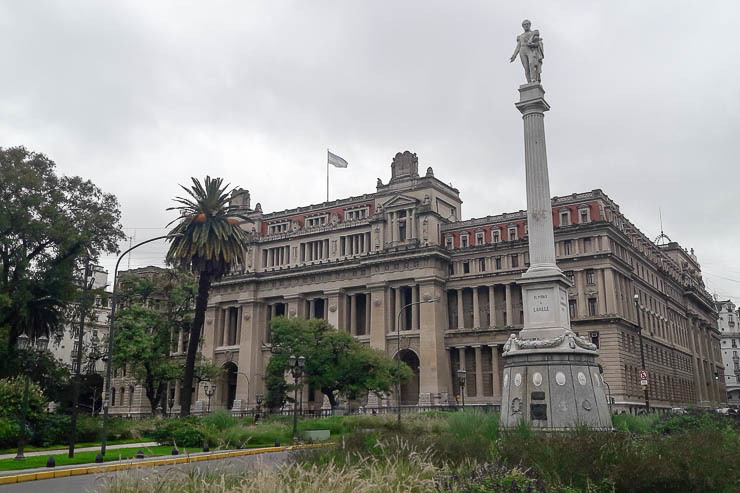 The setting of the presidential palace along the Plaza de Mayo is the real draw here, but you can take tours of the property as well. While not as impressive as the White House, it is a cool place, and at least you know where Madonna actually performed that whole “Don’t Cry for Me Argentina” song in that dreadful movie Evita, haha. One of the best and quickest ways to get to know a big city like Buenos Aires with so much to do, is to hop on a local organized tour. 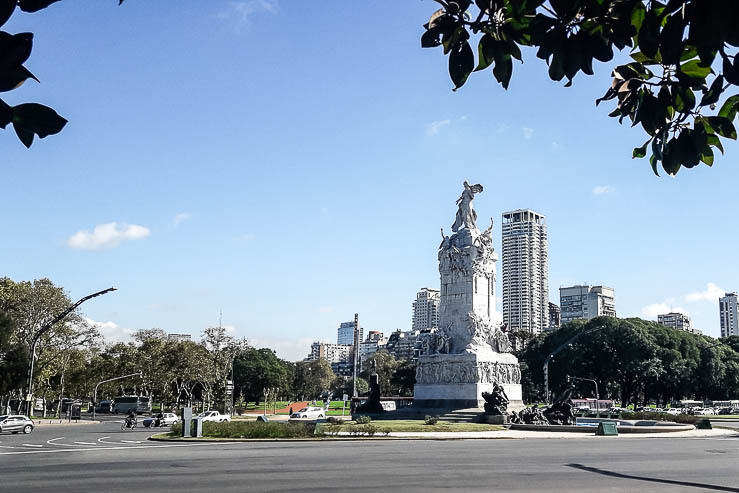 There are some really awesome options available from a free walking tour of downtown or the Recoleta Cemetary, to some more elaborate tours like a tango tour or the Tigre Delta. Be sure not to miss out on my guide to the best Buenos Aires tours in another post. 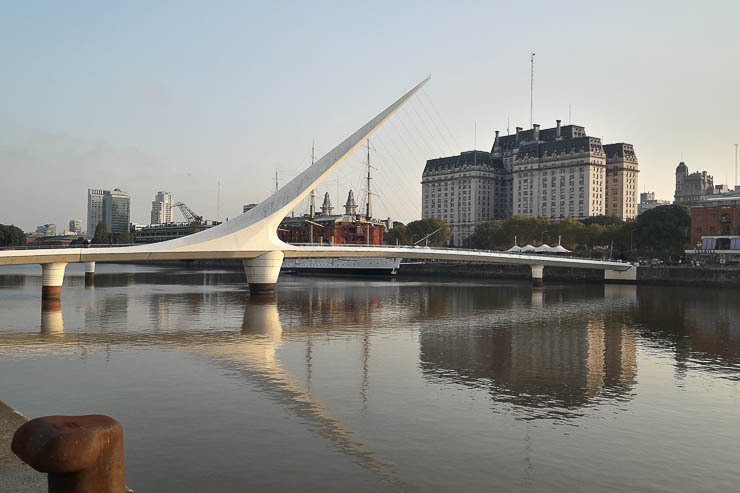 Sitting to the east of San Telmo, across the Rio de la Plata, sits the neighborhood of Puerto Madero. What was once a neglected and undeveloped part of the city has turned into a center for high rises and fancy developments. 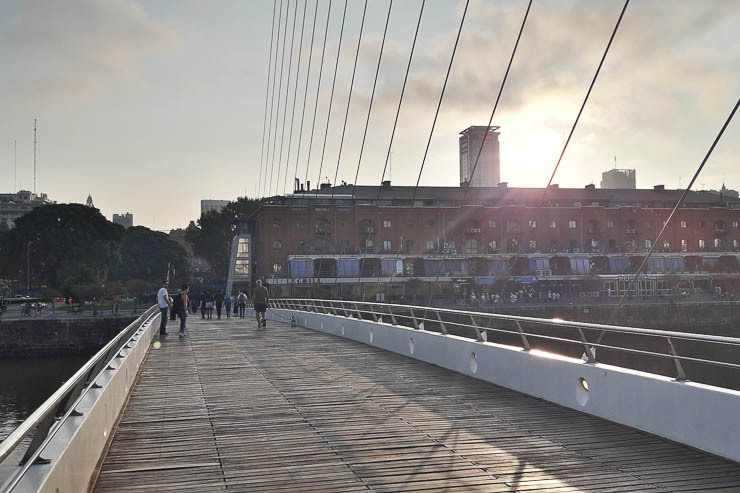 I’d recommend that you take a leisurely stroll along the waterfront, before crossing over the Puente de la Mujer (interesting side note, all of Puerto Madero is dedicated to female leaders through street names, statutes, etc) into what is actually the Puerto Madero neighborhood. The waterfront here is dotted with cafes and restaurants, and it makes for an awesome afternoon. 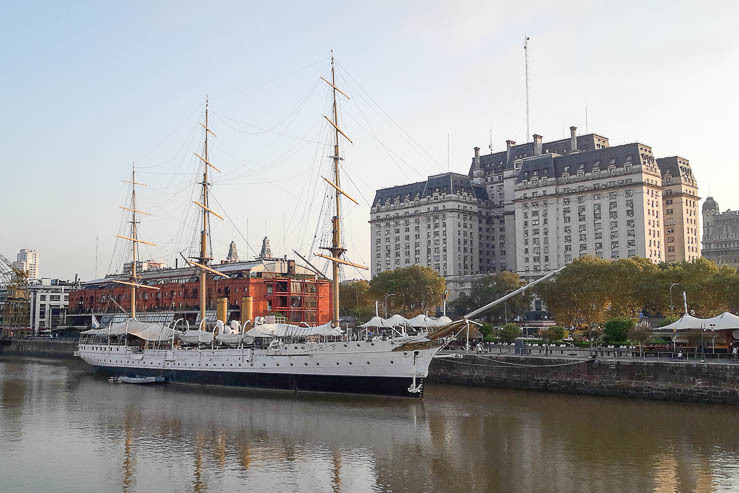 There are cool landmarks along the way, like the Presidente Sarmiento sailboat from the Argentine Navy, which makes for photogenic backgrounds. 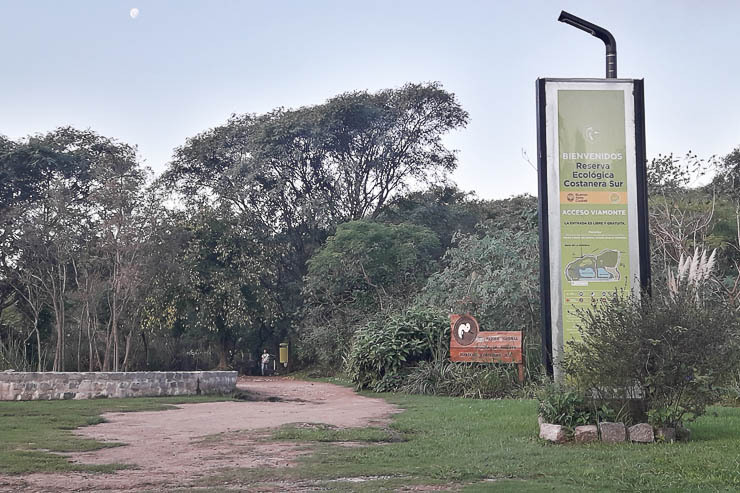 But the coolest part is passing beyond the high rise buildings to the Costanera Sur Ecological Reserve which offers the best way to escape from the noise and chaos of a big city and is where local portenos go for fresh air. 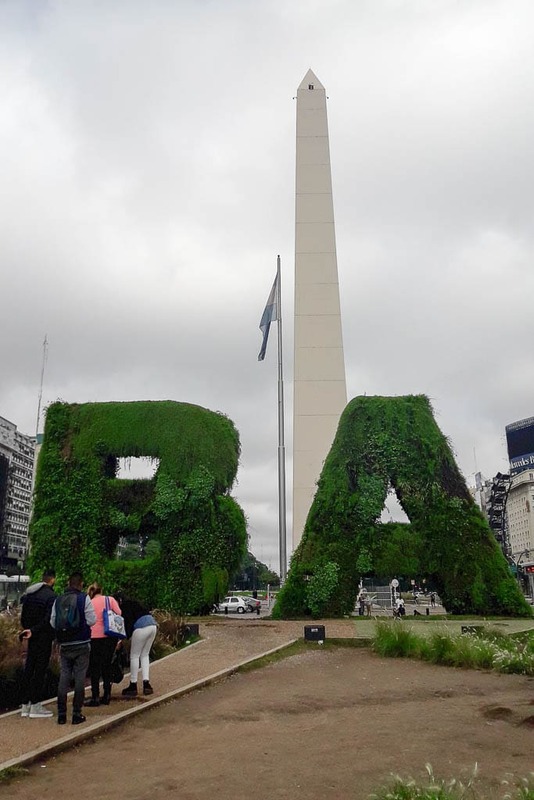 While this article stretched well over 3,000 words in length, I still feel like I only scratched the surface of all the incredible things to do in Buenos Aires. While I was fortunate to have a month to live in this city and explore it fairly in-depth, there is still so much more I’d love to see, do, and experience here. I have high hopes that I will visit Buenos Aires again soon. It is, without a doubt, my favorite city in all of Latin America. It’s just too bad that their economy is so terrible and they suffer from so much inflation, but otherwise, it is an amazing place. Here is a map of some of these things to do in Buenos Aires to help you locate yourself and plan your ideal day in town. Did you enjoy this article about the best things to do in Buenos Aires? Please take a second to share it on Pinterest, Facebook, or Twitter. Thanks! Great and informative critique of Buenos Aires. We spend two to three months in B.A. every year and thoroughly enjoy the city, the people and the ambiance of the different areas. The one area that is beautiful and residential that you left out was Recoleta. The buildings represent different eras of architectural beauty with an emphasis on France. It was a pleasure to read your critique. I am always interested in hearing about any great airline deals anywhere in the world. 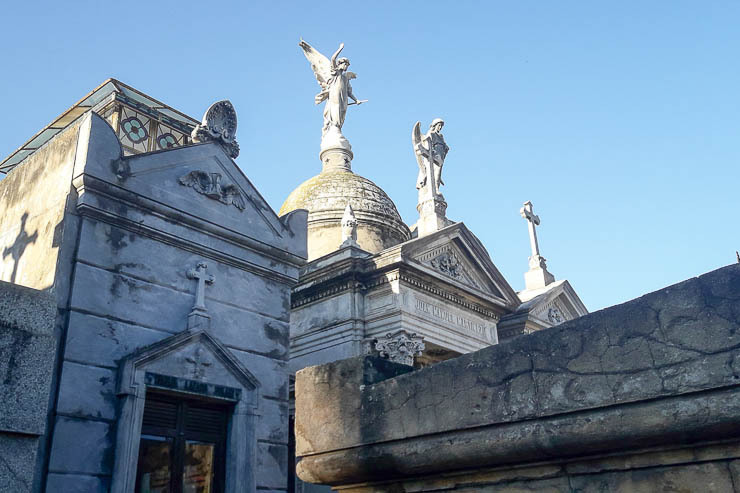 You’re right, I should’ve made a more obvious mention of the Recoleta neighborhood beyond what I said in the self guided walking tour, I’ve updated the article to try and better reflect how cool the area is. Thanks!